The term Hearts and Arrows is used to describe the visual effect achieved in a round diamond with perfect symmetry and angles. 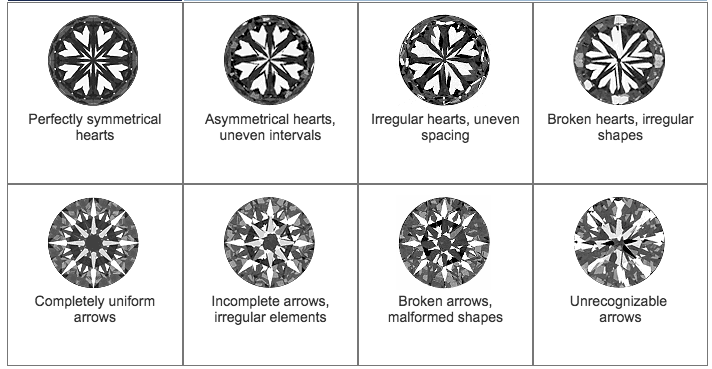 When observed under magnification, the perfectly aligned facets of the diamond reveal the Hearts and Arrows pattern.From the bottom, eight flawlessly symmetrical hearts can be seen then when viewed from the top, eight completely identical arrows. Every industry has an iconic person or product; and in each industry, there is only room for one such star. When it comes to the diamond industry, the Hearts and Arrows diamond is the masterpiece and most renowned phenomenon associated with diamonds. When viewed from the crown (top), an ideally cut diamond should show eight symmetrical arrows. Furthermore, when the diamond is viewed from the pavilion (bottom), it should reveal eight symmetrical hearts. Due to the extreme level of cutting precision required for symmetrical patterning, Hearts and Arrows diamonds were sometimes called “super ideals”. Currently, the term “super ideal” is used to define a diamond with superior light performance, material quality and precise optical symmetry. Not all diamonds with an excellent cut rating (GIA) or ideal cut rating (AGS) will automatically qualify it as a hearts and arrows diamond. Technically speaking, the formation of a precise Hearts and Arrows patterning is due to extreme care that is taken when polishing each facet to exact angles and proportions. This level of precision goes way beyond the criteria needed to achieve an “excellent” symmetry rating.